I spent nearly two months without a working refrigerator this summer. This was not some intentional extreme-green experiment. It just happened. When the fridge first went out, at the beginning of June, it was impossible to find a moment to deal with it. And then, as time went on, it simply wasn’t a priority. Living without refrigeration forced a few adjustments, it’s true, but nothing too major. Since I do most of my provisioning from my yard, it meant that I didn’t pick anything until I was ready to make use of it. Fine. I also cut out eggs and dairy, which was easier than I expected (nuts are a great alternate way to add substance). The biggest challenge, particularly in the early part of the season, was that I could no longer make a big batch of [something] and live off it for three days. But cooking every day is not such a bad thing. Anyway, last week I finally got around to replacing the old klunker, which had come with the house, with a shiny new energy-efficient model. 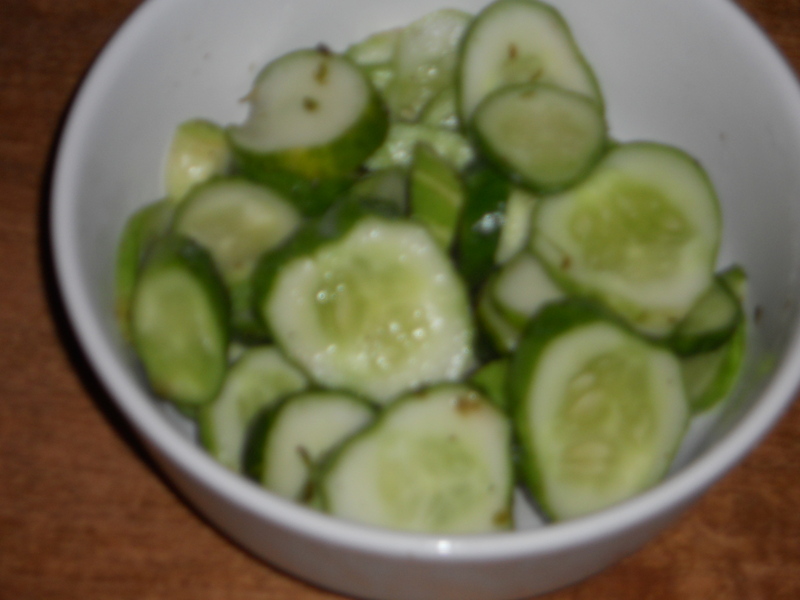 There are few vegetables that go with cold as well as cucumbers. I sliced a few and tossed them with a little salt, a little sugar, and some crushed fresh dill. After an hour or so in my new fridge they were a perfect snack. Also, I made some cheese. I know, I know, historically, the whole point of cheese was to preserve milk in the days before refrigeration, but I confess… I just couldn’t go there. So my house has been cheese-free for awhile. 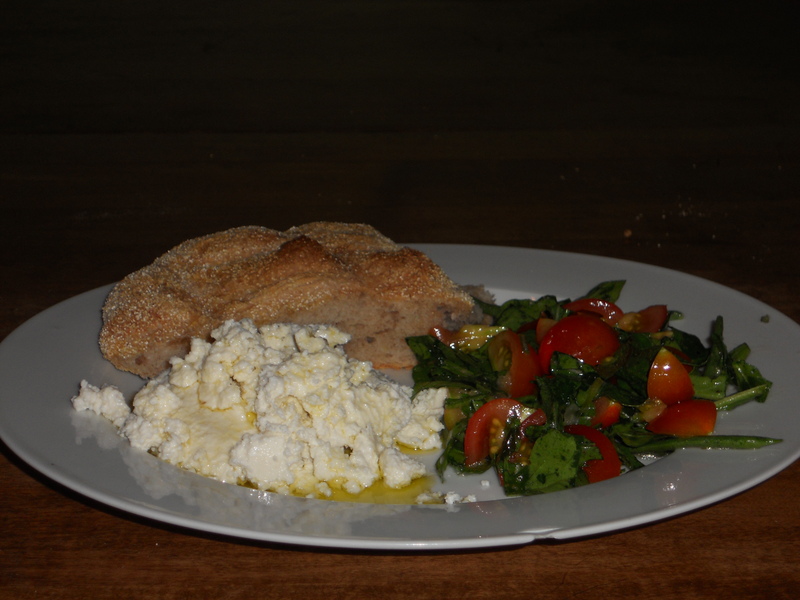 And there is nothing that says summer like a nice fresh ricotta, flavored with lemon and thyme and then drizzled with olive oil, accompanied by a sharp-flavored salad of arugula, olive oil, and tomatoes still holding the warmth of the sun. And the next day: leftovers! 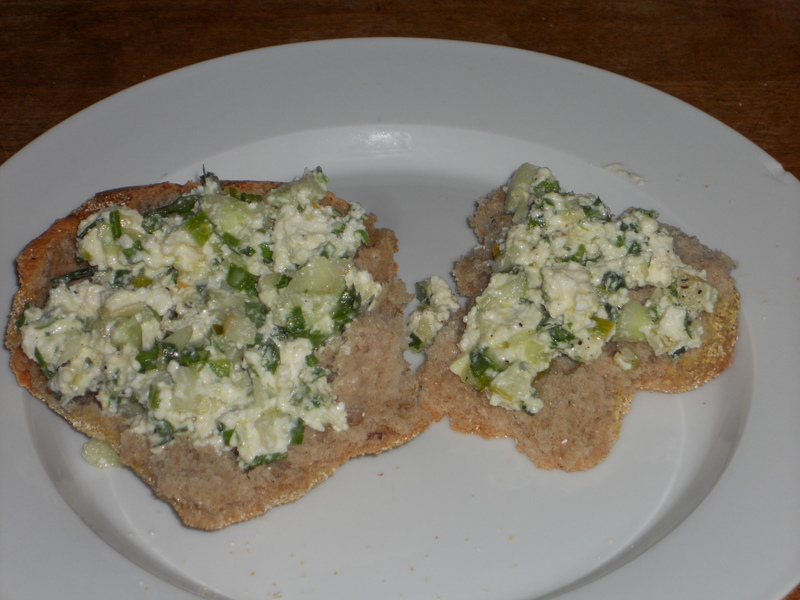 Ricotta with chopped cucumbers, mint, chives, olive oil. Pretty cool. This entry was posted on July 31, 2010 at 5:40 pm and is filed under cheese, cucumbers. You can subscribe via RSS 2.0 feed to this post's comments. You can comment below, or link to this permanent URL from your own site.